AUM hOMe Shala is a yoga studio and school in the heart of beautiful Coconut Grove in Miami, Florida. We offer accredited yoga therapy certification and yoga teacher trainings (including children's and prenatal yoga), MELT Method classes and workshops, and a multitude of other yoga-based wellness offerings. Find out more at our website: http://www.aumhomeshala.org. 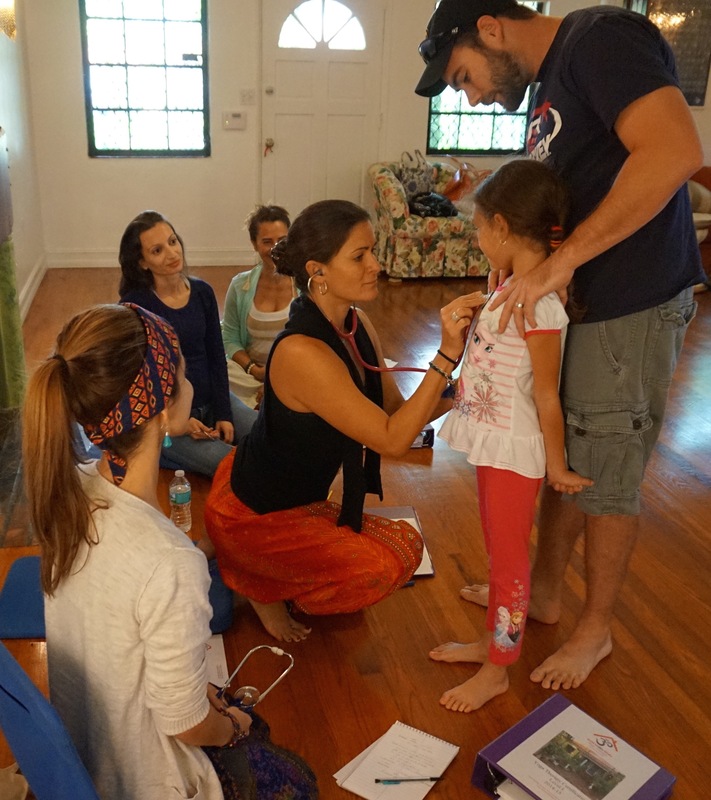 Training Clinical Yoga Therapy Candidates to take vitals on children. Clinical Yoga Therapy Training for working with Breast Cancer Survivors. Clinical Yoga Therapy open to the community on Saturdays from August through June, the clinic provides free, ongoing yoga therapy protocols to individuals dealing with a wide range of health conditions, including spinal cord injuries,Parkinson Disease, MS, auto-immune disease, cancer, chronic respiratory and cardiac conditions, fibromyalgia, severe scoliosis, etc. Clinical Yoga Therapy Candidates and their supervisors create customized protocols for each individual, and follow the client through a series of six sessions over a two-month period. Funded by a $15,000 seed grant from the National Parkinson Foundation, the program has a two-pronged approach that includes yoga therapy trainings for those who work with this population, and small-group classes for those living with these diseases and their caregivers. The free yoga therapy training is designed for yoga teachers, caregivers, and health-care workers who work with or are interested in working with individuals who have Parkinson's and other neuro-motor degenerative diseases (e.g., MS and ALS). The free small-group classes assist individuals with Parkinson's, multiple sclerosis, and other related health conditions and challenges to manage their condition, reduce symptoms, restore balance, and increase vitality. AUM Home Shala is committed to the development of programs for underserved student populations. We introduce yoga programs in Miami-Dade County Title I public schools each fall, as a means of helping youngsters manage test stress as they prepare for the FSA (Florida Standards Assessment). Prior to the first yoga class, students take a 90-question online survey, prepared by Shala educators, which helps us determine their specific needs in various areas of health, stress management, and lifestyle. Upon completion of the program, students take an online post-survey that shows us in which areas they have received the greatest benefit. Past year's program have been supported by a Rachel Greene Memorial Fund grant from Kripalu Center for Yoga & Health. In past years, the Dade County school system asked us to work with their students for three full months leading up to the FSA, during its administration, and following the FSA. AUM Home Shala's accredited Yoga Therapy Program is a clinical approach to blending the yogic wisdom of the East with the complementary medicine of the West. The curriculum is designed to train yoga teachers as yoga therapists, equipped to apply the tools, techniques, and philosophy of yoga to help treat common and chronic conditions in clinical settings. The program comprises two modules and a clinical practicum. Graduates are equipped to work not only with private clients but also with medical specialists, including physicians, physical therapists, chiropractors, and osteopaths. Funding supports partial scholarships enabling applicants with financial need to attend the course and bring yoga therapy back to their communities. Alzheimer’s is the sixth leading cause of death in the US and an estimated 5.6 million Americans have the disease, with no cure in sight. In this class series, AUM yoga teachers and yoga therapists work with patients and their caregivers to provide yoga-based practices to help delay the progression of memory disorders and provide strategies for memory improvement. We’ll create a supportive community in which seniors can experience social, physical, and mental stimulation, and caregivers can learn tools to manage stress. According to Yoga Journal, recent research suggests that yoga and meditation may play a role in preventing and improving symptoms of Alzheimer’s, which is the most common form of dementia and the sixth leading cause of death in the United States. In the first study to suggest that memory loss may be reversed, yoga and meditation were included as part of a complex, 36-point therapeutic program. Another study found that yoga and meditation may help Alzheimer’s and dementia patients and their caregivers socialize and feel better.